Plans for new limits on how much London's major airports can charge airlines have been put forward by the UK's Civil Aviation Authority (CAA). The regulator has proposed capped increases in take-off and landing fees at Heathrow and Gatwick airports, and plans to monitor prices at Stansted. The measures, which are planned for 2014 to 2019, could lead to lower air fares for customers. They have so-far received a mixed reaction from airports and airlines. The CAA will now consult on the plans before making its final decision early in 2014. Airports have called for less regulation and say increases in airline fees are necessary to fund investment. Meanwhile airlines have argued that airports such as Heathrow are overpriced, and higher fees result in higher prices for customers. 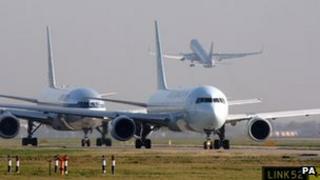 The regulator said Heathrow, London's busiest airport, should be allowed to raise fees by the rate of inflation minus 1.3% for the five years from April 2013. That is significantly below the current rate of inflation plus 7.5%, and below the inflation plus 5.9% requested by the airport's operators. Media captionIain Osborne from CAA: "An improvement in passenger experience"
The CAA justified the caps by saying it had found "clear evidence of substantial market power" at Heathrow. At Gatwick, the CAA said it would prefer to strike a deal with the airport operators on price, but proposed a cap of inflation plus 1% as a back-up. The airport had earlier called for the removal of "regulatory barriers to growth". At Stansted it said it wanted to impose a price-monitoring regime, rather than a price cap. Andrew Haines, CAA chief executive, said its regulations were about "protecting consumers". In a statement, Heathrow said it would be examining the CAA's proposals "carefully" before giving its response, but said its status as the UK's only hub airport made it a "strategically important national asset" that required continued investment. Gatwick described its proposed price cap as "too demanding on the airport and would reduce our ability to invest". Airlines said the CAA's plans did not go far enough. But Willie Walsh, the chief executive of British Airways' parent company IAG, said the company would be making "strong representations" to the regulator. "Heathrow airport is over-priced, over-rewarded and inefficient, and these proposals, which will result in an increase in prices," he said. "The Gatwick proposals, which will result in a significant increase in charges, are completely unjustifiable."